The frock is a casual summer garment that can be worn by women of all ages. Dresses and frocks are almost similar in nature. However, frock designs are generally for more casual occasions while dresses maybe for both casual and formal occasions. A one-piece garment with a skirt of any length maybe referred to as a dress or a frock. These one-pieces with a skirt usually have to be informal in nature to be termed as a frock. The word frock has been losing currency in the modern fashion world. However, it is still used to refer to loose, casual and informal dresses in England and also in India. It may also refer to the loose outer garment worn by nuns. A Trapeze frock or dress has a trapezoid cut. It has a narrow neck line and arm holes. The bodice is also narrow before it flares out into a tent like shape. It lies comfortably on one’s body and is easy to carry and floaty. It can be considered an almost architectural dress style. This frock design began as a trend during 2007. It is a loose dress hanging from the shoulder. It does not have any waistline. This dress also does not include the use of belts or such accessories. A line frocks are usually fitted on the upper body but loose towards the hem. It generally refers to a type of frock that is fitted from the shoulder to the waist then widens towards the hem. It refers to a kind of frock whose skirt is tight fitted. It usually has a vent at the back or at the sides due to its close fitting feature. When worn as a part of a suit, a pencil skirt maybe formal attire. However, it can also be worn as an informal outfit as a part of a frock with a tight lower portion. 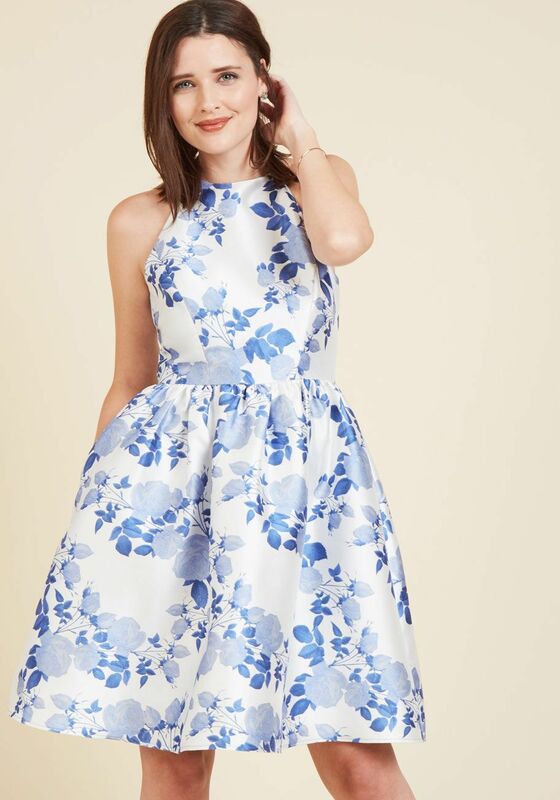 A balloon frock is an unique design. It has a fitted upper portion however the lower portion tends to get dressy. The skirt portion of such a frock is fluffed up like a balloon with an open end. This type of frock design is a borrowing from the design of men’s shirts. They may have collars or buttons upfront including sleeves and cuffs. They are usually made up of crisp cotton or silk just like a man’s shirt would be made. This type of frock design has a fitted bodice. This fit ends just below the bust giving a high waist appearance. The skirt is gathered, long and loosely fitting. This type of dress is especially suitable for pear shaped body types. This dress is designed to emphasize the waist. It is fitted and straight cut dress, nipped at the waistline with no waist seam. This dress comes in various forms and patterns but is usually worn knee length and has short sleeves. This type of dress has a fitted bodice and flares out at or below the hips. It has geometric cuts to give it the appearance of a handkerchief. This type of flare skirt is very flattering for curvy body types.